Here is a new Cebu Pacific seat sale as low as P299 base fare from Cebu! 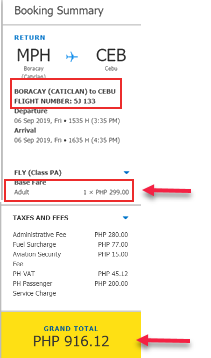 Book your May to September 2019 trips via the ongoing Cebu Pacific promo tickets. Domestic trips cost as low as P299 for trips to/from Cebu. Lots of local destinations on promo from Cebu. For international travel, fly from Cebu to Macau for as low as P899 base fare. Other base fare promos also available for other Asian destinations like Singapore, Hong Kong, Incheon or Tokyo. 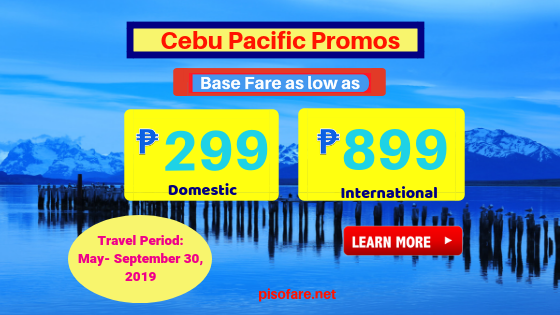 Cebu Pacific promo fares are base fare promos good for one-way travel covering only the base fare and 7 kilos hand carried baggage. Base fare promos cover only the base fare and exclude Web Admin Fee, taxes, Fuel Surcharge and Terminal Fee. To get the Cebu Pacific sale tickets, you may book online at www.cebupacificair.com. Promo Code not required in booking. Another way of availing promo fare is by purchasing these at Cebu Pacific sales/ticket offices, travel agencies and ticket booking offices. Calling Cebu Pacific Reservation Hotline Numbers would be another option n getting the affordable fares. 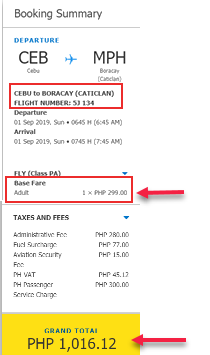 If you have good internet connection, it is best to book Cebu Pacific low fares online. Doing it yourself affords a leeway to get the best deals. No worries if you don’t have a credit card. You can pay your ticket thru Debit Card, PayPal or Payment Centers. Read How to Pay Ticket Booked Online by Cash. So, if you are planning to travel in the next months and your route is included on this seat sale, it is best to book or buy ticket thru this seat sale. Book na po kayo! Cebu Pacific sale tickets are LIMITED! Want to receive updates on new Cebu Pacific promos? Like our Facebook: PISO FARE TICKET to get seat sale updates in your newsfeed!